The Warwick is a Gastropub located in the heart of London’s Pimlico, just 5 minutes walk from Victoria station. We offer a range of seasonal freshly prepared food and a comprehensive drinks selection along with first class service – all within informal and relaxed pub surroundings. Free WiFi is available for all customers and dogs are welcome! The dining room is ideal if you want conversation. Otherwise classic busy pub downstairs. Good was very good and the best mushy peas I've ever had. The Sunday Roast was actually quite average, despite the many positive comments I have read elsewhere. The front staff were patient and friendly though. Arrived and were welcomed by staff, we had booked a table upstairs but when taken up the dining room was empty and freezing cold. The staff were more than happy to move us back downstairs so we could eat in the bar area. The pub has a good atmosphere and the staff are friendly. The food in my opinion is very average. I had a steak with about 4 tiny slices of potatoes and green beans, my friend had pork belly, mash and some freezing cold kale that we sent back for them to cook. I would definitely recommend the pub for a drink but perhaps go somewhere else to eat. We booked an early dinner on a monday at The Warwick Pimlico and it was very quiet when we arrived. As you would expect on a monday at 5:30. When we left a few hours later the place had almost filled up and the atmosphere was lovely. The food was nice. Pretty small menu of basic pub dishes, but they were tasty and well-prepared. The real winner is the 5£ cocktails though! For someone on a budget it is a very luxurious feeling to have a pre-dinner cocktail, and something I can not often afford, but at that price we went for it, and it was great. Noisy, we were assigned a table near the door (so we felt the cold coming inside every time someone came in or went out), staff were not friendly and we were offered the bill as soon as they decided that we finished our meal. Unfortunately, our waiter was heavily under the influence which made our experience uncomfortable and unnerving. garlic butter had loads of flavour! ), and the venison in the pie was inedible. We sent the pie back, querying whether it was actually venison, and the waitress was great - she apologised profusely, offered another meal free of charge and came back to us immediately to say it was definitely venison and the owner got it fresh from source. Perhaps it was just a bad batch of meat, as my boyfriend had the sirloin steak which wasn't great either. Overall a disappointing meal, saved only by the friendly, helpful service. Great evening with attentive friendly service. Had a lot of fun and really enjoyed the evening. Fish and chips were fab, the steak a little thin and fatty. The website described it as a gastropub. It is far from it. A very poor and basic menu. One choice, gnocchi, was an extremely small portion - kindly the waiter only charges us half when we pointed this out. Other meals were fine. Downstairs ambience was poor - just a basic pub frequented by locals - and the dining room not much better. Had a lovely meal here with a friend before meeting others for drinks. The service was very good and quick, and the food delicious. Good for a quick meal with lively atmosphere. We had a lovely meal at The Warwick. I booked it last minute as I saw they were dog friendly and I had my puppy, Ziggy, with me. The tables were nicely spaced out and the music was good and at the right volume where you can still hold a conversation. The staff were very accommodating of Ziggy and brought him a bowl of water. They also offered a table service instead of going to the bar which was very helpful. Staff were attentive but not too much and the food was lovely too; It all felt very homemade and tasted delicious. I will definitely be back with Ziggy soon. Dover Sole was absolutely fabulous. Good selection of wines. The only downside was it was far too loud, could do with a separate dining area. Staff were also a little slow, but it was quite busy so benefit of the doubt! Definitely on the upper end of pub food. Good find, friendly and relaxed staff/vibe, not too busy but recommend booking ahead for a table as seating limited (due to not being crammed in). Restaurant quieter than the bar area, we preferred to eat down in the bar for ambience. As an out of towner, London can be intimidating when you are booking a table for my family and a foreign business colleague's family who were meeting for the first time! 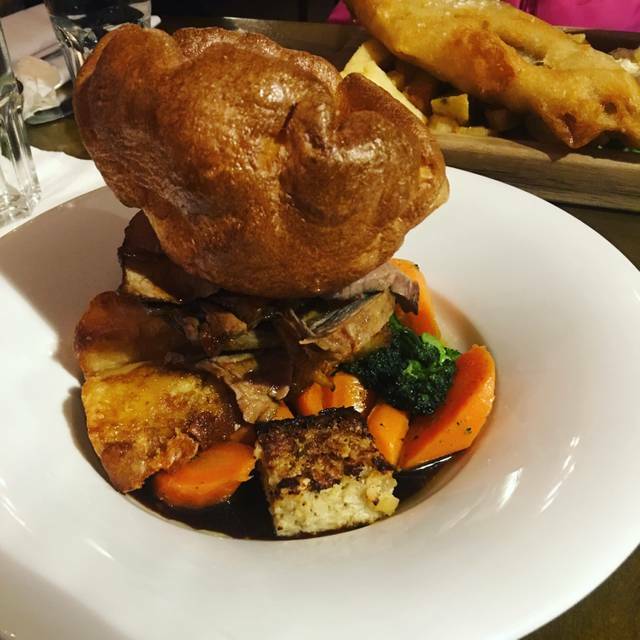 I am so glad I chose The Warwick, it was relaxed despite being busy downstairs and the food was not only excellent, was really good value for money. We had an excellent time, thank you to everyone there. We will be back! We went for Sunday's quiz night and had a meal beforehand. A good night out. Very pleasant evening. Great atmosphere. Friendly and helpful staff. Great food. Highly recommend. 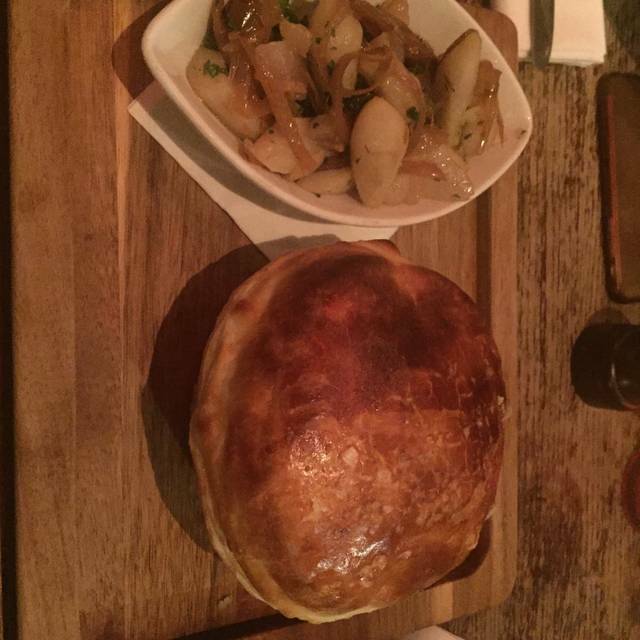 Had the Venison pie dish, absolutely delicious dish that was surprisingly well presented, definitely one of the best British meals I’ve had in London. Fantastic Sunday roast and we stayed for the quiz night which was excellent! 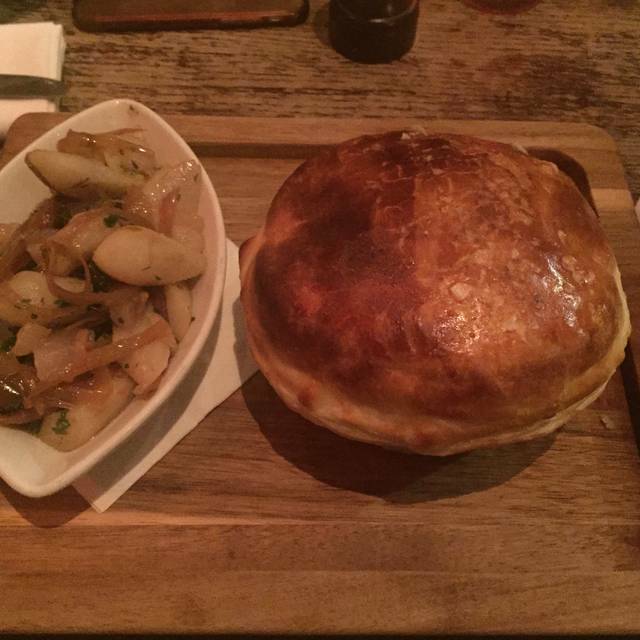 Went to the Warwick to show some friends from out of town what pub cuisine was like and it did not disappoint. We shared a Beef Tartare with truffle and quail egg before having mains of roasted lamb leg, fish and chips, a Venison and Ale Pie and a Bavette Steak. The food itself was of a good standard and well portioned in general, well flavoured however it could have been better with a few tweaks and improvements. The starter was probably the highlight, good sized dish for sharing between 2 (we had 4 but weren't particularly hungry) or even for a hungry 1! The menu had apparently recently changed to our disappointment with yorkshire pudding, duck fat roast potatoes and other sides no longer being served. The mains choice also lacked variety with no pork option (no crackling!). We originally had one order of the Rabbit but this was sold out after the waitress checked with the kitchen. An asparagus special starter was also unavailable leading to the second disappointment in terms of ordering. We finished our meal by sharing a sticky toffee pudding which again was satisfactory, filling and tasted great, but just lacked anything that would have made it particularly memorable. The staff were wonderful throughout although there was a lighting issue which meant the lights were adjusted every 10 - 15 minutes proving a little distracting. Great place to chat, catch up and get some grub, not really for occasions where food is the centrepiece or focus of your visit. Poor wine availability. Good (year) wines on the menu were not available. Tried to ask for same price! Food was normal pub food. Nothing gastro at sll. Sirloin steak was barely edible. Cod was extremely salty. Will never go back. Wonderful pub with great food. We sat in the pub area, which was slightly loud, but we were still able to hold a conversation. Federica was our server and she was great. Enjoyed her conversation and recommendations. I had the rarebit and wife had the chicken confit. Both were outstanding. When we are back in London, we will make this a priority to visit. No-frills British gastro pub. Decent food and reasonable prices for Pimlico standards. The waitor is not professional at all. He ordered the wrong food, not apologized for mistake and the lunch took almost two hours. Great food, friendly staff and a lovely setting. We were drawn to The Warwick because the menu looked interesting and the veggie options for my wife were,in particular, different from the ubiquitous seasonal fare of risottos and mac and cheese etc. We weren't disappointed, the food was great and the staff friendly. Minor issue with hand dryers not working in the loos but not enough to detract from a great overall experience; will definitely call in again. Great place for bangers and mash. I was in London alone on business and ate here solo in the upstairs dining room on a Friday night, enjoyed it greatly. Good food with large portions. The staff are extremely helpful and friendly with prompt service. The Warwick pub is not a mere public house for pints and shots. It's a venue with a decent choice of seasonal well-cooked food. As a gastro pub they tick all points from good quality ingredients to presentation. Thumbs up for such dedication to good food! For me Gazpacho was a highlight of the summer menu followed by asparagus and truffle risotto. The risotto was tiny bit softer and creamier that I prefer but still very nicely seasoned with pepper, hers and shavings of some special slightly smoky cheese which I never came across before. Well done! Really good service and friendly environment. Staff were good fun and extremely polite. Food came out quiet cold but tasted good - suspect it was a one off problem and not the morm. Also didn't raise with staff so can't expect a resolution if they don't know. Wouldn't stop us going back though. I was surprised that the restaurant upstairs was empty as it was a Thursday night - but actually a relief as it was teeming and very noisy downstairs. Standard gastropub fare in a pleasant dining room - it's a 2 weeks ago now and I can't recall anything particularly special or at all bad about the food or the evening overall, and I'd happily go back if I was in the area. Wonderful staff from the front of house to the kitchen. They made us feel so welcome and were very accommodating of our group, including a baby. The Sunday roast was delicious as was the fish and the duck. The upstairs dining room was lovely. All round, it was great! I booked a table for Sunday lunch. There were two vegetarians with us, but there was no problem finding food for them. I have passed the pub in the evenings when it's full of people having after work drinks. So I wasn't too sure if the food was ok or even if it served food, apart from basics. The food was excellent and almost too much. 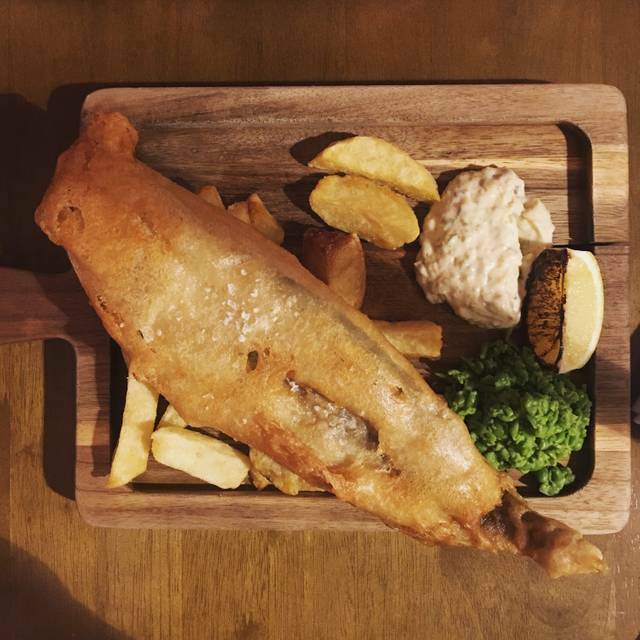 The fish and chips were large and the roast of the day well cooked. The service was very good too, friendly but not intrusive. The person who served us even cut up some cork to rebalance the wonky table. Usually it's a bit of paper under the leg. Will definitely reccomend to friends and also work colleagues. People were great. The sausages snack as an appetizer were awesome and the fish and chips were huge. Steak was a little tough. The staff was friendly as well. We'd definitely go back. The Warwick Pimlico is among those pubs where I wanna come back for food, especially their Sunday roast (try chicken!). They expertly cook livers too, and chips. Hearty, flavoursome and nicely served food goes perfectly with whiskies and beers. The dining room upstairs is quiet and charming in the evenings. Consider it for dinner with your other half. For group of friends book downstairs, it's lively and more fun! The food at the Warwick matches that all the other "gastro pubs" in the immediate vicinity, but for some reasons tables are much easier to come by. Downstairs is usually too noisy for a meal, but upstairs is generally quiet, perhaps a little too quiet for some, but you cannot have everything! Service on this occasion (we use the Warwick regularly) was willing and acceptable, but the waitress was very inexperienced. The Warwick seem to have a very high turnover of such staff and not to offer any training or to check skills. Whilst, she was apologetic for having to ask me to open the wine, this is a fairly basic skill one would expect of a waitress! This place remains one of my favourites for a work day lunch. Quick, good and value for money. Can highly recommend it. Most pubs that serve food fall into the expensive bistro category with few actually delivering on taste and selection, the Warwick in Pimlico is different, it boasts a restaurant upstairs that changes it's menu frequently and produces some outstanding tasty dishes that don't leave the customer hungry! My friends and I have as a result started a Warwick dining club, we come together about once a month to enjoy this food and the wine and catch up. If it wasn't for the first time treat being so good we wouldn't have kept coming back. I recommend this place to everyone who likes to eat in a quiet restaurant serving excellent food in a sort of oldie world dining room. The pub downstairs might be heaving with humanity and upstairs it's peaceful bliss.